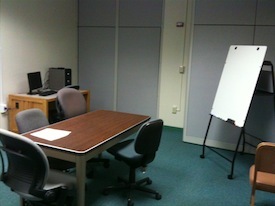 Two Presentation Practice Rooms for UHM students to use are located in the Science and Technology area of the first floor of the Hamilton Library Addition. 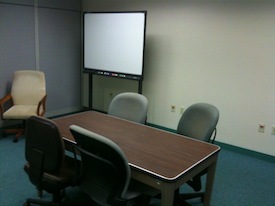 Each room is equipped with a Windows computer, Microsoft Office, Microsoft Office Viewers, an LCD projector, projection screen, white board, and a work table with chairs. 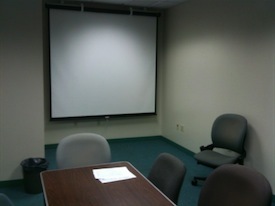 The first of their kind on campus, the Presentation Practice Rooms give students the opportunity to rehearse a presentation before giving it at a conference, in class, or for an interview. 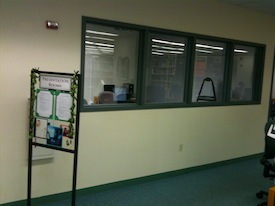 There is enough space to have a small peer audience critique the presentation. Students can bring their own cameras to video a presentation and critique it for improvement. Use of the rooms is on a reservation basis only. RESERVE a room online for the desired date and time (Use the name that appears on your ID). When you sign up online, you will receive immediate email notification. To secure your reservation you must confirm your reservation within 30 minutes using the link provided in the email.